Smart Currency Business is proud to be partnered with local charity Solidarity Sports. Solidarity Sports was set up to give disadvantaged inner-city children the opportunity to play sports together. Their vision is simple: to create ‘a world where every child who lives on the margins of society has the confidence to choose any path in life and follow it with strength and skill’. Since its formation in 2007, the Solidarity Sports’ programmes have gone from strength to strength and now include healthy eating, art and residential field trips. You can donate directly to Solidarity Sports here. 100% of your donation will go to the charity. 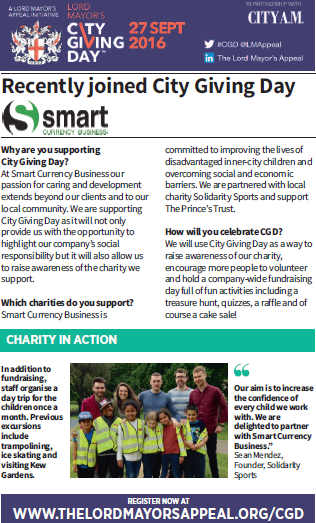 Smart Currency Business’s staff organise and volunteer at monthly events held for the children at Solidarity Sports. Past events have included ice skating, bowling, trips to the Science Museum and days out at Hyde Park. If you or your company are interested in getting involved with Solidarity Sports, please get in touch for more information. Organised by the London Lord Mayor’s Appeal, City Giving Day helps businesses raise awareness of the support they provide to local communities and charities. An annual celebration, City Giving Day ‘unites the City of London in celebrating the differences made and lives changed through its charity and community partnerships’. With our company-wide Pirates of the Caribbean-themed fundraising day, featuring a Caribbean buffet, treasure hunts, pirate games, quizzes and more, we’ll raise extra money for the charities we support. To take a look at pictures and see how much money we raise follow us on Twitter @SmartCBusiness! This City A.M. panel will highlight some of our charity work. We’d like you to get involved with our fundraising activities. Just drop us a line at csr@smartcurrencybusiness.com to tell us you’re interested.